In 1952 Russell Hobbs introduced the world’s first electric coffee maker with a keep warm function. The Legacy Cream Coffee Maker has been inspired by the style of the original yet has an up-to-date, compact design. 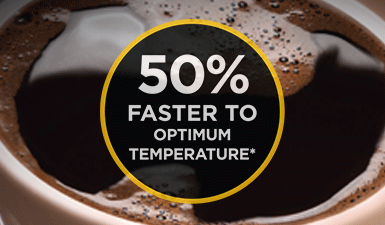 It uses advanced showerhead technology to ensure more of the coffee is captured and dissolved, so you enjoy a richer coffee flavour, and less waste in filter, and it reaches the optimum brewing temperature 50% faster*. Easy to use and with a dishwasher safe reusable filter, the Legacy Cream Coffee Maker can make up to 10 cups at a time in its 1.25 litre glass carafe and, if you don’t need that many, it can be set to make 1-4 cups. 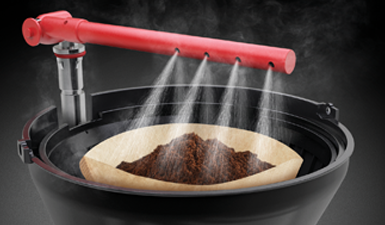 It has a red illuminated light ring that comes on during brewing and stays on during the ‘keep warm’ stage.